Content Note: today we’re talking about eating disorders. There will not be any detailed descriptions of disordered eating. Between the ages of thirteen and twenty, I watched my close friend deal with an eating disorder. In many ways, she was lucky – she’s alive and healthy, for one. She was never hospitalized at 90lbs, because she never got there. Luckier still, given what put her in danger – she had what is known as Eating Disorder Not Otherwise Specified. Not quite anorexia, not quite bulimia, but rather an intermittent mix of the two. Unless she told you, you’d have no idea. I can count the number of people I care about who have had eating disorders on more than one hand – and those are just the diagnosed cases. There are a few more friends that I’ve suspected of disordered eating, and still more who deal with the legacies of their mothers’ eating disorders. Two of those friends required hospitalization, but – thank goodness – all of them are alive. 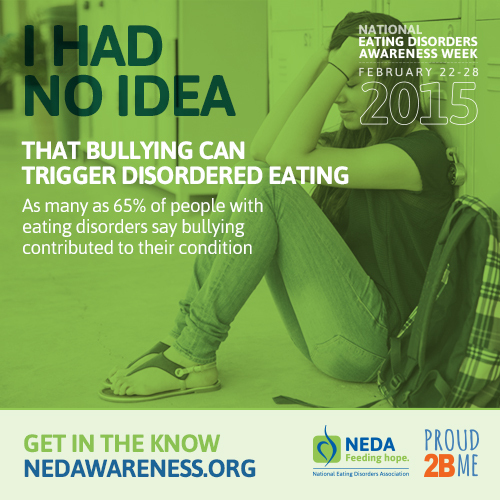 This week is Eating Disorder Awareness Week, and the theme this year is #ihadnoidea. In keeping with this theme that so powerfully resonates with my personal experiences, I want take the opportunity to highlight 4 common misconceptions of eating disorders and outline a few ways you can seek help for yourself or someone you love. I will not provide detailed accounts of disordered eating behaviors because a) I am not a survivor myself; and b) I do not want this to read as a how-to guide for disordered eating, as so many pieces on eating disorders do. Myth: Eating disorders are only found in women. The National Eating Disorder Association estimates that men account for 10% of patients with diagnosed eating disorders. Particularly worrisome is that lifetime history of bulimia nervosa is 21 times higher among Latino men than White men, and 1.2-1.9 times higher than Black and Asian-American men. Among gay and bisexual men prevalence is much higher; a Columbia University Study found that 15% of GB men had experienced an eating disorder in their lifetime. Myth: Eating disorders only effect white people. People all over the world have eating disorders. In the US, African-American and Latina women are significantly more likely have both a lifetime and past-year history of bulimia nervosa. The same is true for binge eating disorder. Myth: “Overweight and obese people may have binge eating disorder, but there’s no way they’re anorexic or bulimic.” There is no mandatory weight cap to have anorexia or bulimia. Yes, obesity (BMI >30) is more closely linked to binge eating disorder. However, a 2008 study found that obese individuals made up 5% of participants with a lifetime history of anorexia and over 30% of those with a history of bulimia. Myth: “Lots of people have some version of an eating disorder It’s not a big deal.” Not only is this assumption wrong, but it’s also quite harmful. Eating disorders have among the highest mortality rates of all mental illnesses. While recovery is definitely possible, it can be long and incredibly difficult, because unlike heroin or alcohol, you can’t avoid food for the rest of your life. People in recovery have to face their eating disorders at least three times a day, for the rest of their lives. Take a free, anonymous screening test to see if you’re at risk for disordered eating. If you’re struggling with an eating disorder, you should know that there are many ways to get help. The National Eating Disorder Association has a great set of resources for help, including a toll-free, confidential helpline you can call at 1-800-931-2237. That link will also have resources (such as this parent toolkit) you can share with your family and friends. Get information about what recovery really looks like. Take a look at the myriad body positivity resources out there on Instagram (@effyourbeautystandards/#effyourbeautystandards is the BEST), Tumblr (not always SFW). Read what we’ve written on the subject here, here, here. Find what resonates with you. If you’re a parent, teach your children to love their bodies. If you’re a health care provider, ask the right questions about eating disorders to ensure early detection and treatment — but be careful not to make matters worse. Become a better media consumer. Don’t just regurgitate the negative messages about body image and self esteem. Don’t engage in body policing. Work to create safer spaces for people in your life that deal with disordered eating. Marques, Luana, Margarita Alegria, Anne E. Becker, Chih‐nan Chen, Angela Fang, Anne Chosak, and Juliana Belo Diniz. “Comparative prevalence, correlates of impairment, and service utilization for eating disorders across US ethnic groups: Implications for reducing ethnic disparities in health care access for eating disorders.” International Journal of Eating Disorders 44, no. 5 (2011): 412-420. Columbia University’s Mailman School of Public Health. “Gay Men Have Higher Prevalence Of Eating Disorders.” ScienceDaily. http://www.sciencedaily.com/releases/2007/04/070413160923.htm (accessed February 25, 2015). Pike, Kathleen M., Hans W. Hoek, and Patricia E. Dunne. “Cultural trends and eating disorders.” Current opinion in psychiatry 27, no. 6 (2014): 436-442. Hudson, James I., Eva Hiripi, Harrison G. Pope, and Ronald C. Kessler. “The prevalence and correlates of eating disorders in the National Comorbidity Survey Replication.” Biological psychiatry 61, no. 3 (2007): 348-358. Crow, Scott J., Carol B. Peterson, Sonja A. Swanson, Nancy C. Raymond, Sheila Specker, Elke D. Eckert, and James E. Mitchell. “Increased mortality in bulimia nervosa and other eating disorders.” The American journal of psychiatry 166, no. 12 (2009): 1342-1346.